Pinnacle Black Label Diamond Coating Detailer is the first and only quick detail spray formulated specially for application with ceramic, quartz, and resin-based coatings! Black Label Diamond Coating Detailer is designed to safely remove light dust and contaminants from coated vehicles without hindering the impressive water beading or sheeting exhibited by the coating. Black Label Diamond Coating Detailer and its gloss-intensive formula increase shine and slickness after each use. Diamond Coating Detailer is packed full of gloss-enhancing nano-glass ceramic particles that add instant shine and protection! Not all quick detail sprays are created equal, and Diamond Coating Detailer is proof. Formulated specifically for application with ceramic, quartz, and resin-based coatings, Black Label Diamond Coating Detailer safely removes light dust without hindering the shine or water beading properties of the coating. 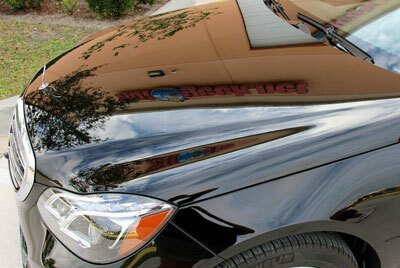 Black Label Diamond Coating Detailer is compatible with all paint, wheel, and glass coatings. Think of Black Label Diamond Coating Detailer as a quick detail spray for vehicles that have been coated with a Black Label Diamond coating or similar product. Formulated using a less concentrated blend of the same nano-glass ceramic particles found in Black Label Diamond Surface Coating, Diamond Coating Detailer instantly adds gloss and slickness while removing light dust and fingerprints. Use Black Label Diamond Coating Detailer anywhere, anytime. Application is as simple as spraying on and wiping off using your favorite microfiber towel. We prefer the Gold Plush Junior, and have found it to be the perfect complement to Diamond Coating Detailer. Black Label Diamond Coating Detailer contains the same protective ingredients found in Black Label Diamond coatings. Rest assured your paint will be clean and slick after each use, with a shine that can only be described as glassy. I haven't used many quick detailers but so far this seems nice. One or two sprays goes a long way and cleans well. However, based on the price I can't say this any better than other quick detail sprays unless it has some magic chemicals that reactivate ceramic coating. Don't think I'd spend the high price point on this again. This stuff felt like water going.on the surface. The booster went on thicker and felt like you were really making a difference.. This stuff is not worth $30. Maybe $10. Great product. Last after several washes. Leaves a very deep shine. Suggest using soft microfiber rags for use. Another winning product. Pinnacle Black Lable Diamond detail-spray and product line are excellent products and Autogeek provides excellent support. ProsExcellent product produces deep shine freshly waxed wet look. ConsCould be considered pricy ... But on the other hand you get what you pay for I. E. A product with superior performance. I am the most meticulous person when it comes to my black ford tauras, and this product along with the pinnacle wax was a four star because I have never found anything that is a five star.